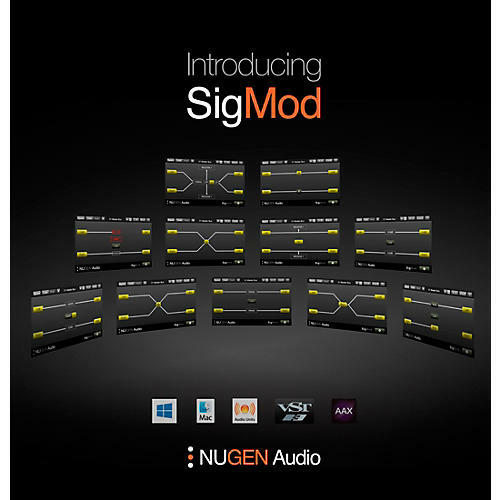 Instantly enhance the functionality of your plug-ins and DAW with eleven different signal modification units. Explore new creative possibilities and quickly add missing features. Each module can easily be inserted, swapped and moved around making new options to correct, convert or tweak your audio. SigMod contains many useful, creative functions which are otherwise difficult to engage, including master & channel strip features, signal monitoring & routing options, mid-side conversion, crossovers and output level protection. Combine these single-process modules in any order to design the precise routing you require. Auto-resizing keeps the signal flow and functionality clear at all times. Add mid-side functionality to classic stereo compressor and EQ emulations, or get creative with mid/side delays, distortion and many other effects by inserting the mid-side encoder/decoder either side of any left/right plug-in instance. Strap the Protect unit across your output bus and this safety module will automatically 'blow', preventing bursts of noise or feedback howls due to system errors, saving both your nerves and your speakers. Manual or auto reset options give you the level of protection you need. Want to try some parallel processing? Drop in the Tap module and you are good to go. Use the Crossover module to split the highs from the lows to apply different effects to different frequency ranges - great for avoiding muddying up the low frequencies or getting creative with automation and sweep effects. Custom signal architecture made easy.